A few months back, I enjoyed telling you about my satisfaction with my new Axiom Odysee FS rear cargo rack, which was designed to work on bike without traditional rack mounting eyelets. Recently, a customer getting ready for a long bike tour came into the Peninsula store looking for a rear rack to fit on his cyclocross bike with disc brakes, and this same Axiom rack worked great for him. When it came time to find a front rack, we had to do some more digging, and ended up ordering him the Ultimate Lowrider Rack from Old Man Mountain Racks. Old Man Mountain is a small company in Santa Barbara, California that specializes in cargo racks to fit any bike, especially those that do not have standard rack mounting eyelets. Look for a review of the Ultimate Lowrider when our customer returns from his trip! In the meantime, I had been in need of a new front cargo rack for my Surly Long Haul Trucker, which DOES have traditional rack mounting eyelets. There are a few good standard racks that would fit the bill, such as the Jandd Extreme or Jandd Lowrider, and of course, the Surly "Nice Rack." But, since we were placing an order with Old Man Mountain anyway, I figured I'd try out their AC Lowrider front rack. The name of the AC Lowrider is in honor of the Adventure Cycling Association. It's a basic alloy front rack. Installation took a quick 10 minutes using the lower- and mid-fork eyelets on the Long Haul Trucker's fork. 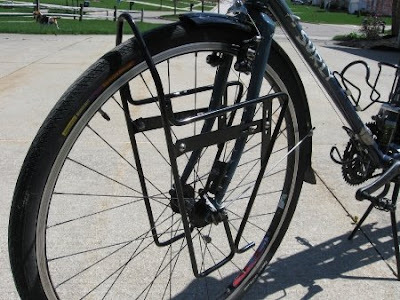 The rack has adjustability while retaining its elegant simplicity; you can adjust the tilt so that the rack and your panniers sit perfectly horizontal. After getting the rack installed, I rode the LHT to the shop today, and the rack (so far unloaded only), seems solid as a rock. When I spoke to the folks at Old Man Mountain when I placed the order, they informed me that they are discontinuing this rack! They have a few left though, so if you've been thinking about getting one, act fast! They said that they sold 250 of them in the year since they released it. When they tried to order more from their factory, their supplier would only make them in lots of 1000, so despite the popularity and quality of the rack, Old Man Mountain decided that they did not want to invest in ordering a four-year supply!